Ogunquit residents pack a Friday hearing about challenges to some signatures on petitions seeking the recall of three selectmen. 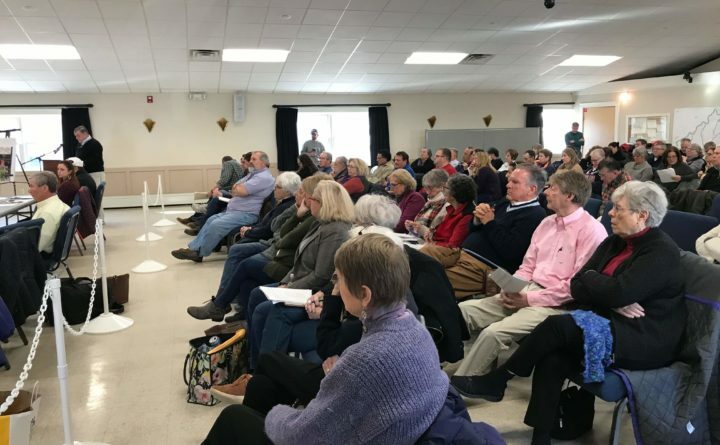 OGUNQUIT, Maine — The town of Ogunquit is currently a town divided, and nowhere was that more evident than at Friday’s public meeting where residents were called to defend their signatures on recall petitions for three current members of the select board. The recall effort seeks to oust Select Board Chair Charles “Bunky” Waite, Selectwoman Madeline Mooney and Selectman Bob Winn. Residents who initiated the recall process did so following the public appeal hearing on Oct. 9 where the three board members voted to support the termination of former fire chief Mark O’Brien. Selectmen Rick Dolliver and John Daley voted against upholding O’Brien’s termination. The hearing was scheduled by Town Clerk Chris Murphy after Ogunquit residents Mary Buck, Barbara Ferraro, Patricia Hussey and Peter Kahn filed challenge to the petitions. The petitioners gathered the required signatures and submitted them to Murphy the day before the Dec. 7 deadline. Working with Augusta law firm Preti Flaherty, the challengers claimed irregularities in the petitions and legal issues surrounding the process. Battle lines were drawn as townspeople filed in and sat on different sides of the room, showing their support for each side of the issue. Frustration boiled over at several points during the proceedings as the petitioners were called to verify certain signatures and legal counsel for the challengers questioned residency of some signees and ultimately asked that entire petitions be disqualified for procedural missteps. Stephen Langsdorf, attorney for the challengers, squared off with town attorney Mary Costigan of the Bernstein Shur law firm asking to question Murphy on the procedures she used to certify certain signatures and how the signatures on the petitions that were left on the counter at town hall were witnessed. Following the review of each challenge item, Murphy agreed to answer questions from Langsdorf, even though legal challenges to Murphy’s actions on behalf of the town were not part of the hearing. Twenty-two voters were challenged, including several from the recall petitioners that were invalidated by Murphy. Local contractor Jerry DeHart gathered signatures and had several called into question by Langsdorf. He defended each one, saying he watched the individuals sign the petitions, and even illustrated his claims with photos. Stephen Weiner’s signature was declared invalid by Murphy because it did not match the signature on his voter registration card. He spoke, saying he realized he had different ways to sign documents, and said he did not blame Murphy for questioning it. Local businessman Rick Barber had his residency challenged, which he said he found offensive. Barber, along with Phil Cavarretta, own resorts or inns in Ogunquit but also own homes in Cape Neddick. Both claim Ogunquit as their legal residence and have been long-time voters in town. “Yes, it’s five minutes down the road, but it’s not different than if someone owns a home in Maryland, or in Florida,” Barber said. Langsdorf questioned the validity of signatures gathered at a pub by resident John Mixon on Oct. 24, saying that his clients believe the signatures were not certified as people signed the petitions. Robin Millward, an Ogunquit resident who signed the petitions at the event, said Mixon did certify signatures as people signed, but she didn’t see him sign each one personally because she had moved to the next petition. Also, Langsdorf questioned Murphy on the certification of signatures at town hall. “We would like to say that this process did not follow the charter, specifically as the signatures called for an individual to certify that they saw the person signing. I believe this is an acknowledgement that the signatures were not all witnessed by you or your deputy,” Langsford said. Murphy said those that the signatures that she and her deputy specifically remembered seeing the people add to the petitions she validated, and those that were not specifically remembered were invalidated. Langsdorf asked that Murphy invalidate all of the signatures on the petition that was accidentally removed from the counter in the clerk’s office and taken home by a town resident. A police investigation last month found that it was accidental, and the resident was elderly with poor eyesight and unaware of the mistake. Langsdorf brought up the signatures of two additional residents who he said were fraudulently added to petitions. One signature was from someone who was out of town at the time the signature was recorded, and another letter was entered into the record from a resident who said that he did not sign the petition and his name should not be on it. “We’re going to ask that based on the evidence that we presented you invalidate this whole process,” Langsdorf said at the close of the meeting. Selectwoman Madeline Mooney, who is being subjected to the recall efforts, was on hand for the hearing. She said she feels motivated and confident that voters will reject the recall effort. Costigan said Murphy will make a determination on the challenged signatures based on the information she heard during the hearing sometime next week.